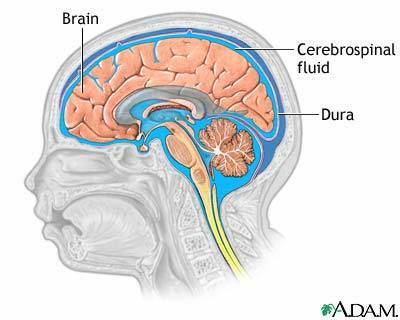 Cerebrospinal fluid is a clear fluid that bathes the brain and the spinal cord. It occupies the subarachnoid space. Literally speaking, the brain “floats” in the fluid. It reduces the friction in the area by serving as a cushion or buffer to prevent mechanical stress to your most vital organ. Cerebrospinal fluid is the product of the choroid plexus. The modified ependymal cells, blood vessels and the ventricular walls are responsible for the continuous secretion of the fluid. Once formed, it circulates from the lateral ventricles, third ventricle, aqueduct of Sylvius, to the fourth ventricle, foramina of the Magendie and Luschka and the subarachnoid space. To balance the normal volume, the venous sinuses in the arachnoid villi reabsorb some of CSF. Normally, 500 ml of cerebrospinal fluid per day is produced. However, because of reabsorption in the arachnoid villi, you can maintain a volume of only 135 to 150 ml. The blood plays an important role in the composition of the fluid. As a filtrate of blood, it contains glucose and protein. However, the amount varies greatly compared with the values in the blood. Red blood cells and white blood cells are not normally seen because of their impermeability to larger substances. By analyzing the composition of the fluid, your physician can have a better assessment of the integrity of your nervous system function. The collection of cerebrospinal fluid is through the lumbar puncture or spinal tap. A trained physician will do the collection by palpating between L3 and L4 or L4 and L5. The intracranial pressure is monitored to assist the professional in the process. After the procedure, you can feel a slight headache due to the pain receptors affected. The symptom is normal and usually disappears after a few minutes. There are several indications for the analysis of the cerebrospinal fluid. The most common is infection. If you suspect the problem, consult your physician about it.